I thought you might like to take a look at one of the stories from Book 3 of The Cougarsamurai Chronicles. Cougarsamurai sat cross-legged in the large dojo (training hall). Today was the day he would put his three most worthy students to the test. Above the doorway to the training hall he had placed a large bag of sand in such a way that as the door opened the bag would fall onto the head of whoever entered. He would summon his three students one at a time. Kanji, friend of Hisoka, was the first to be called. After a few minutes Cougarsamurai heard a knock at the doorway and called for Kanji to enter. Kanji opened the door and stepped forward just as the bag of sand fell towards his head. At the last instant, sensing the bag, Kanji stepped to the side and the bag fell harmlessly to the ground with a thud. Cougarsamurai instructed his student to replace the bag and come to sit next to him. Kanji carefully placed the bag back above the doorway and moved to sit next to his master. A few minutes later there was a knock at the door. It was the second trainee to be called for. The Samurai was particularly interested to see how this trainee would deal with the scenario. It had been a while since their encounter during a one-on-one archery contest (see the Cougarsamurai Chronicles book 2), and he was interested to see exactly how much progress had been made. Denjiro opened the door and stepped forward. The bag of sand came crashing down toward his head. Calmly and swiftly he stepped aside, drew his sword and split the bag straight down the middle, so that it landed in two halves at his feet. Kanji could not contain himself and started to clap vigorously. Cougarsamurai said nothing except to instruct Denjiro to place a new bag of sand above the door and then come and sit next to him, to wait for the final student. 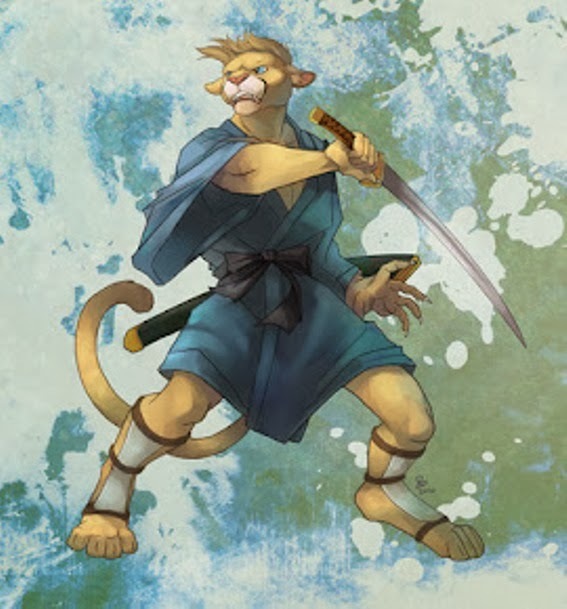 This was the one Cougarsamurai was especially interested in. Hisoka had been a challenge for a long time; rarely did he learn the lesson until it was repeated. Nonetheless he had high hopes for him and sat up expectantly when he heard a knock at the door. He called for the Hisoka to enter. Hisoka opened the door and was about to step forward when he sensed something was wrong. Instead of stepping forward he merely stood still and observed. Sure enough a bag of sand fell to the floor in front of his eyes. It was only then that he stepped forward toward his teacher. Cougarsamurai and the other two students grinned broadly at Hisoka. His teacher asked him why he had not entered. Hisoka said that one lesson he had learned was to look before you leap. Or in this case before you enter the dojo, with your teacher and two friends looking mischievously on. All four burst out laughing. Cougarsamurai said that he was pleased with his students’ performances. No one had failed the test. Watching the news I was amazed to see a segment about a footballer who is paid over £300,000 a week! This really got me thinking about how this would make that person feel, especially with regards to their self worth. As a footballer this person is certainly worth more than someone who does not have his particular skill. However as human being he is surely worth no more than anyone else. I think part of the problem that most of us have in our lives, is that we compare ourselves to others continually and rate our sense of self-worth accordingly. We use status, power and money as often the yardsticks by which we measure our self-worth. When a newborn infant we all are of equal value. It is only by comparing ourselves to others as we grow that we start to devalue ourselves. Society and schooling are constantly re-enforcing this. I would like to suggest that you treat yourself and everyone you meet as if they were newborn. Rate everyone, including yourself, with a self-worth rating of 100%. If you have made mistakes in your life it doesn't mean you're self-worth rating should decrease. Everyone makes mistakes. It is part of being human. Importantly, you should not rate yourself higher than anyone else either. Everyone should be allowed to have equal self-worth.